Curtiss Robin J-1 Deluxe "Ole Miss"
Curtiss Robin J-1 (Model 50H) "Ole Miss"
The Curtiss Robin J-1 (Model 50H) "Ole Miss" on display in the Golden Age of Flight gallery at the National Mall building. In 1935, this Curtiss Robin established a world record for sustained flight, using air-to-air refueling. The Curtiss Robin series was produced in the late 1920s and early 1930s as a 3-plane general aviation aircraft. This object is on display in the Golden Age of Flight exhibition at the National Air and Space Museum in Washington, DC. In 1935, this Curtiss Robin established a world record for sustained flight, using air-to-air refueling. After two unsucessful attempts the year before, Fred and Algene Key took Ole Miss up from Meridian, Mississippi on June 4 and did not touch the ground again until July 1, for a total time in the air of 653 hours and 34 minutes, or 27 days. During the flight, the Keys received fuel and supplies 432 times from another aircraft. They braved severe thunderstorms and an electrical fire in the cabin before returning to a safe landing in Meridian. The Curtiss Robin series was produced in the late 1920s and early 1930s as a 3-plane general aviation aircraft. Ole Miss varies from a typical Curtiss Robin by virtue of modifications made for the flight, including a new fuel tank, engine servicing catwalk, and a sliding top hatch for receiving supplies in flight. The Curtiss Aeroplane and Motor Company, in a departure from its characteristic military aircraft production, designed the Robin for the emerging civilian market of the late 1920s. This three-seat monoplane flew in the spring of 1928 with a 90-hp Curtiss OX-5, the engine that had powered Curtiss JN-4 Jenny trainers in World War I. Robins offered flight characteristics as straightforward as their appealing lines and modest performance. A distinctive feature (shared with Fairchild cabin monoplanes of the period) was side cockpit windows that ran almost to the floor. The biplane dominated aviation until the mid-1920s when monoplane designs, featuring cleaner lines with less drag, began to appear. Then, in 1927, Charles Lindbergh's historic flight from New York to Paris showed the world that the era of the monoplane was truly at hand. His Ryan Spirit of St. Louis-like the Stinson SM, Bellanca Columbia, Fairchild FC-2, and Ford Tri-Motor-all featured a single high wing and fully enclosed cabin. The Robin, built to the same formula, was conventional in structure with a welded fuselage built of rugged steel tubing that was rectangular in cross section. Except for the cowling, the airplane was entirely fabric-covered. Orange with black trim was a common factory color scheme. More than 300 Robins were fitted with the surplus OX-5 and sold to the civil market at $4,000. Others were powered by the 170-hp Curtiss Challenger (a six-cylinder, twin-row radial engine that was less than satisfactory) and the excellent 165-hp Wright J-6-5 Whirlwind. These later versions, with the added expense of new engines, sold for almost twice the price of the lethargic OX-5 Robin, but offered substantially better performance. Robin production took place in St. Louis, Missouri, in association with the Robertson Aircraft Corporation, a local fixed-base operation that ran the contract air mail route between St. Louis and Chicago (Major William B. Robertson had been one of Lindbergh's financial backers). Some 750 Robins were built by the Curtiss-Robertson Airplane Manufacturing Corporation before the Depression and competition from newer types called a halt to production late in 1930. One of aviation's most delightful records was set in a Curtiss Robin by Douglas 'Wrong Way" Corrigan. He allegedly set off from New York for California in July 1938 and touched down in Ireland 28 hours later, claiming that he had accidentally read his compass backward. The plucky pilot-who had been denied official permission to fly the Atlantic-thus earned his nickname and delighted the world. Aviation's exuberant adolescence was also marked by a penchant for endurance records. In July 1929, Dale Jackson and Forest O'Brine set an impressive record in a Challenger-powered Robin, with the help of aerial refueling, remaining aloft for 420 hours and 17 minutes. When the record was extended by a Stinson monoplane the following June, they took off again in the Robin on July 21, 1930, and set a new mark of 647 hours and 28 minutes. 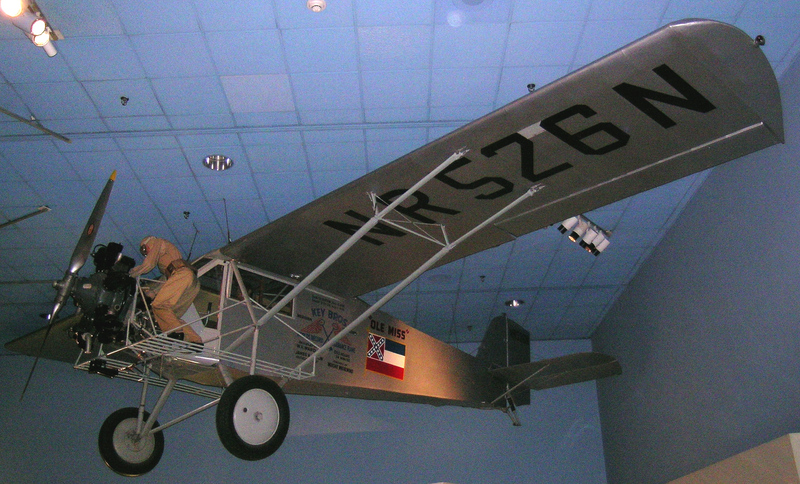 The greatest record for sustained flight was set five years later in a Whirlwind-powered Curtiss Robin J-1 Deluxe named Ole Miss. After two unsuccessful attempts in 1934, brothers Fred and Algene Key took off from Meridian, Mississippi, on June 4, 1935, and landed again 27 days later for a total flight time of 653 hours and 34 minutes. There to greet the exhausted fliers on the evening of July 1 were 35,000 wildly cheering spectators. Among the dangers they had faced were severe thunderstorms and an electrical fire. During the flight, Fred and Al Key took turns manning the controls and sleeping on the extra fuel tank behind them in the cabin. They received food, fuel, and supplies 432 times through a sliding roof hatch from another Robin. A metal catwalk on the forward section of the aircraft made in-flight maintenance and lubrication of the engine possible. Their Wright Whirlwind engine consumed 6.500 gallons of gasoline, at a rate of 10 gallons per hour, and 300 gallons of oil. Their estimated ground track was 52,320 miles, or more than twice the circumference of the earth. 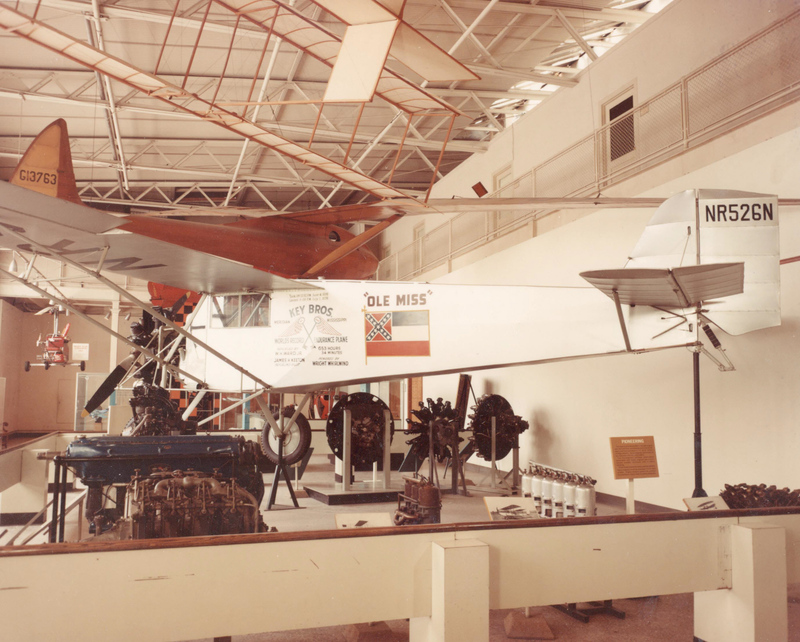 Almost twenty years after its famous flight, the Key family offered Ole Miss to the National Air Museum. On July 2,1955, Fred Key flew the famous Robin, now fully restored, to National Airport in Washington, D.C., where it was formally presented to the Smithsonian Institution. 108E. Three-seat light cabin monoplane. The Key brothers set an endurance record of 653 hours and 34 minutes, June 4-July 1, 1935 in the Robin. Wright J-6-5 engine. High-wing, tailwheel design.